This is a block of butter. I tossed the pen in there as a size reference, pretty much to show you that it's way more butter than the pound you usually buy at the grocery store. The butter gets flattened to about a half inch thick and shaped into a rectangle. This is what gets folded up into the croissant dough. The croissant dough contains: flour, yeast, sugar, water, milk, salt, a bit of old croissant dough, and more butter. The dough gets rolled out to about the same thickness as the butter, the block of butter gets placed on top of the dough, and then the dough gets folded over the butter to fully encase it, and thus begins the process of rolling out the dough, or 'laminating the dough' as it's actually called. 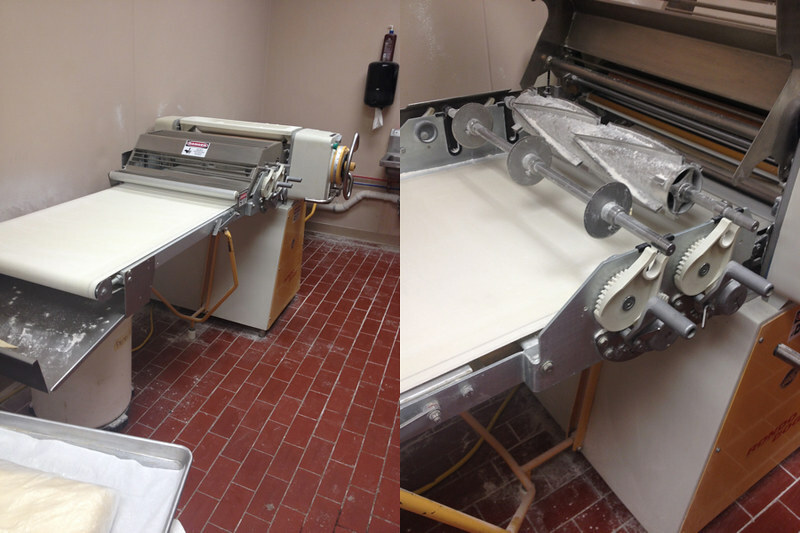 This is a sheeter; it's an extremely expensive machine used to roll out dough. It's also super fun to use! The flat surface extends to the other side and in the middle there are two rollers that can be adjusted for thickness. I won't get very technical here, but basically you put the dough on one end and roll it back and forth through the rollers, gradually adjusting the space between the rollers until you reach the thickness that you want. The metal parts in the second photo are the cutters for the plain croissants. The triangle cutter cuts them to the right shape and the pizza cutters cut them down so you're not left with a bunch of connected triangles. Here's a view from the other side of the sheeter. 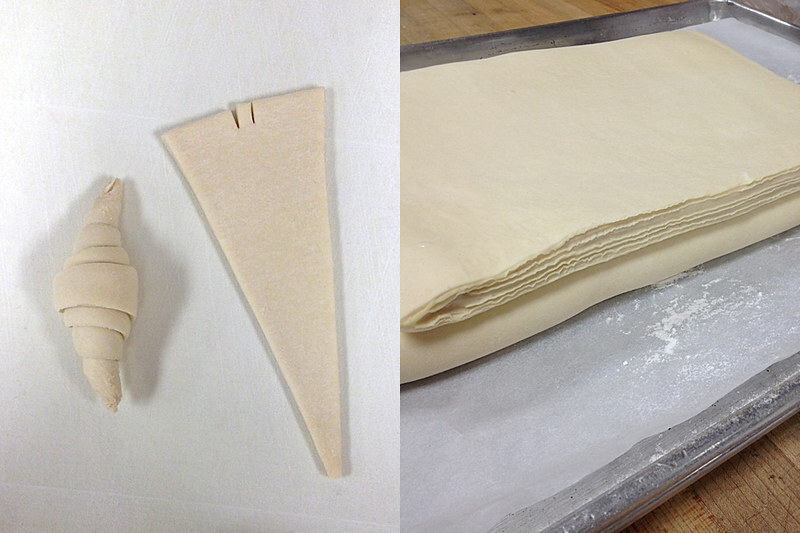 The first photo shows the dough all rolled out, the second shows the dough after it's folded. This is called an envelope fold (because it's folded like an envelope). The way croissants are made is a series of turns and folds. Basically, you roll the dough out once, fold it, roll it out halfway and rotate it 90 degrees, roll it out the rest of the way and fold it again, then repeat that whole process two more times. That's how you get the delicious flakey layers! 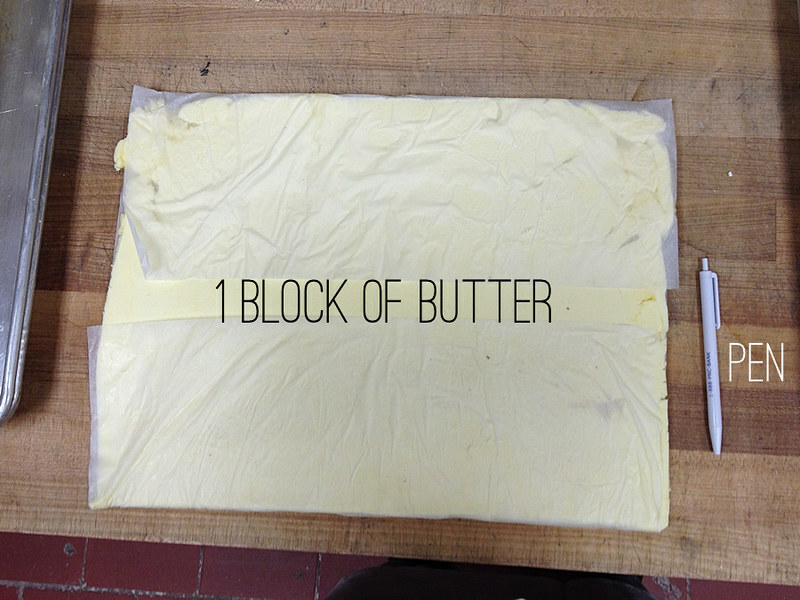 That block of butter that we started with is getting distributed throughout the dough and each time the dough gets folded, more layers are formed. See? Layers! (Like onions and ogres!) All those little waves in the second photo are actually butter! So. Much. Butter. That's why they're so good though. 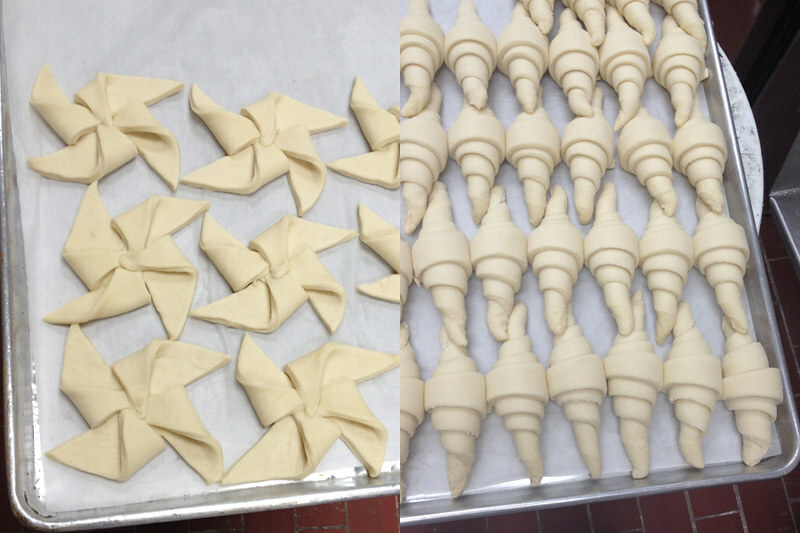 The first photo is to show you how the plain croissants are actually shaped. Those cutters two photos up cut the dough into that triangle shape (the notch in the center is just there to allow the dough to stretch a bit more). What you do is take your triangle, pointy tip downwards, stretch it ever so lightly downwards, then roll the top down towards the tip while working the corners out with your palms. It sounds more complex than it is. It's all about hand movement, pressure, and speed. Ok, so maybe it is slightly complex. So that's just how you make the plain croissants... the chocolate ones are whole 'nother story and I didn't take photos of that process. It's similar except that you don't use the cutters, and you add chocolate, obviously. The danish are also made from croissant dough and those are basically made by rolling out the dough, cutting it into squares and folding or cutting the squares in a particular manner to achieve the shape you want. (Like the pinwheels above.) Again, I didn't take any photos of that process. When you're working with croissant dough you want to work fast! It doesn't take long for the butter to soften and then the dough becomes a soft unworkable mess. Besides, I said I'd keep it simple, so plain croissants are all you're getting today! I hope you enjoyed learning how croissants are made! 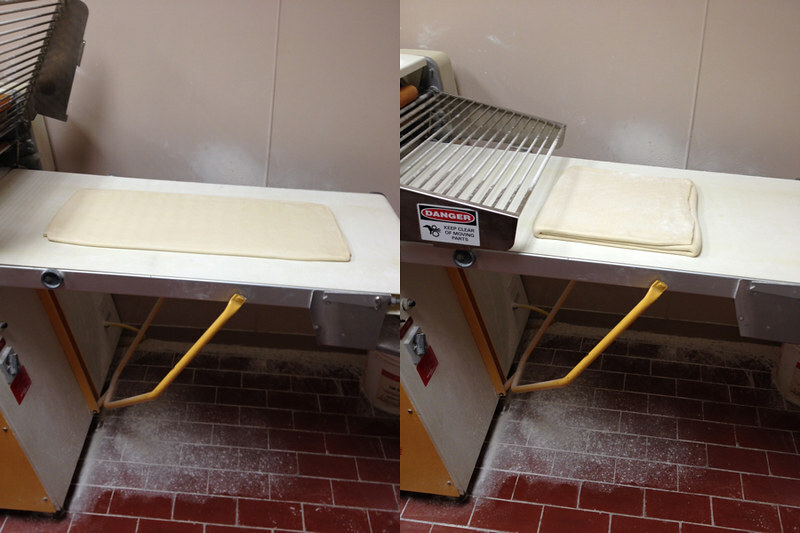 That's why it's so much easier to have the sheeter, so you don't have to roll dough out by hand! It is fun but you're right, the hours are tough. I'm definitely a morning person though, so I don't mind!